Chunky Pandey worked as an instructor in acting school in 1986. He used to be senior to many junior budding artists such as Akshay Kumar. Pandey debuted his acting career with the 1987 multi-starer film Aag Hi Aag opposite Neelam Kothari. Film producer Pahlaj Nihalani gave Chunky Pandey his first break in 1987 by signing him up for two films, his debut film and Paap Ki Duniya. His second successful film was Paap Ki Duniya with Sunny Deol and Neelam. Subsequently, Pandey appeared in many multi-hero films from 1987 to 1993. In 1988, Pandey was appreciated for his supporting role in N. Chandra's movie Tezaab featuring Anil Kapoor and Madhuri Dixit. Pandey played the character of Babban, Munna's (Anil Kapoor) friend. For his performance in Tezaab, Pandey was nominated for the Filmfare Award for the Best Supporting Actor. Since then he has appeared in many films with mixed success throughout the late 1980s and 1990s. Most of his films where he had the leading role did not fare well at the box office from 1992. In most films, he was cast in supporting roles to senior actors like Rajesh Khanna, Dharmendra, Jeetendra, Sunny Deol and Sanjay Dutt. Some of those hit films with him in second lead, are Paap Ki Duniya (1988), Khatron Ke Khiladi (1988), Ghar Ka Chiraag (1989), Nakabandi, Zahreelay (1990), Rupaye Dus Karod, Vishwatma (1992), Lootere (1993) and Aankhen (1993). His solo hit was Parda Hai Parda (1992 film). The advent of the 1990s saw a new wave of actors like Aamir Khan, Salman Khan and Shahrukh Khan taking on roles as "romantic heroes", while Akshay Kumar, Suniel Shetty and Ajay Devgan grabbed the "action hero" roles. Pandey found it difficult to slot himself in either category. In addition, by the late nineties, solo-hero films were back in vogue instead of the multi-hero films in which Pandey was generally cast. Chunky grew increasingly tired of playing second fiddle to more prominent actors, but had difficulty being seen as marketable, other than supporting household names. "I was offered hero ke bhai ka (lead actor's brother) roles," Chunky said. "I (told them), 'Boss, not happening.'" He moved to act as hero in Bangladesh films. In 1995, he was offered his first films as the lead hero in Bangladeshi films. He acted in six films between 1995 and 1997 as hero in Bangladesh and all of them were successful. However he got no films at all in Bollywood between 1997 and 2002. Chunky Pandey returned to Bollywood in 2003 playing minor supporting roles in Qayamat: City Under Threat, Elaan, Don: The Chase Begins Again and Apna Sapna Money Money. In 2005, Pandey was critically acclaimed for his dark role as an underworld gangster in the Ram Gopal Varma film D – Underworld Badshah. Later, director Ram Gopal Varma roped him in for Darwaaza Bandh Rakho, a dark comedy thriller in which he played one of four robbers who hold a family hostage. Pandey has played the role of the Indo-Italian "Aakhiri Pasta" in the 2010 comedy hit Housefull followed by his reprised roles in the sequels Housefull 2 in 2012, and in Housefull 3 in 2016. Though he has recently been starring a character actor, Chunky doesn't want to be pigeonholed into doing comic roles. "I don't think I am restricting myself to doing only comedy. I am hoping that someone offers me something else," Pandey said. "It requires a lot of guts for someone to cast me in something else. I am just hoping that someone sees something else in me other than comedy." 1981 Rocky Bell-ringer student (extra) in song "Rocky Mera Naam"
^ "Chunky Pandey's Star-Studded Birthday Bash: SRK, Gauri, Malaika and Others Spotted at Party". International Business Times. 26 September 2013. Retrieved 16 April 2016. ^ "From arclight to mining light: Chunky Pandey won offshore mining rights, but it was no happy ending". The Economic Times. 23 May 2015. Retrieved 16 April 2016. ^ "Chunky Pandey shooting in Lucknow". Times of India. 14 October 2015. Retrieved 16 April 2016. ^ "The Second Life of Chunky Pandey". Open The Magazine. ^ "Chunky Pandey doesn't want to stick to comedy". The Times of India. ^ "Chunky Pandey to play double role in 'Housefull 3'". The Times of India. 21 March 2016. Retrieved 16 April 2016. ^ "Wait, what? Gulshan Grover is playing a good guy now. Guess the villain". Hindustan Times. 27 March 2016. Retrieved 16 April 2016. 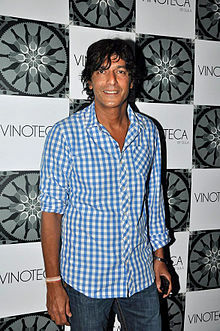 Wikimedia Commons has media related to Chunky Pandey.